Let This udderly adorable Cow Stage Puppet milk a smile out of you! With her silky soft hide and mooovable mouth, she'll be the cream of your puppet collection, and that's no bull! 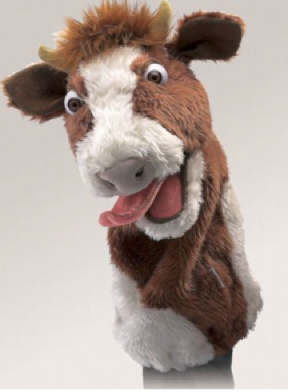 Features pose-able eyes and a movable tongue too Cow Stage Puppet is 14, is recommended for ages 3 and up.